Facehuggers from the Alien franchise are literally the last things in existence you'd ever want anywhere near your mouth. Initiating the third stage of the Xenomorph life cycle inside your body would be quite unpleasant, to say the least. But this real-life Thanksgiving Facehugger made of chicken, crab, and more chicken, on the other hand, needs to be on your table and gunning for your gullet immediately. But be careful: You may end up eating so much of this delicious feast beast it'll burst out of your stomach! The epic spread of parasitoid-inspired poultry and seafood, which has been dubbed The Facehugger Feast Roasted Chicken, is hatched from the brain of Hellen Die and was posted to Reddit and imgur where, as if this writing, it's already garnered more than 1.7 million views. Die, who works in coordination with her sidekick dog, Lucifer, The Lord of Barkness (she runs the social media accounts), has a background mostly in horror films and television working as everything from a writer to costume designer to blood slinger. With those skills, Die says on her Instagram that she's able to use "Hollywood level practical effects to make disgustingly delicious food." And according to these images, more of which are in the gallery below, disgustingly delicious this bird-crab creation most certainly is. Even Adam Savage approves. 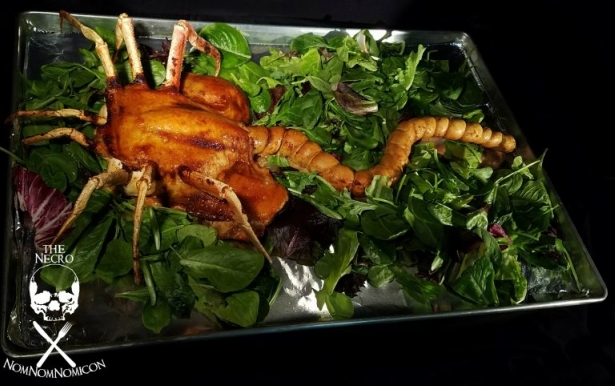 In terms of the foods involved in preparing the Facehugger Feast, it's a combination of a full-size roasted chicken (which can be subbed with a turkey), snow crab legs, and homemade chicken sausages for the tail. You can check out the full recipe and walkthrough on Die's site, The Necro-Nom-Nom-Nomicon. Be warned: You'll come across a bunch of concoctions that sound like they came straight from H.P. Lovecraft's kitchen, including a Glass Shard and Skull Cake and Green Glowing Absinthe Gummies. If you're wondering if Die will tackle the Chestburster next, say a few extra words of gratitude at this year's family or M-class starfreighter crew table because she already made it last year. And according to Die, "It turned out amazingly delicious." Still realistic enough to scare the stuffing out of you though, isn't it? What do you think about this extraordinarily accurate fowl and crab Facehugger? Do you think you could make this thing or do you don't dare touch it? Let us know in the comments below! More weird and funky food dishes!